It’s natural for Leaf fans to be impatient with what often feels like the world’s slowest ‘championship re-build’—45 years and counting. And while there is a degree of frustration—and I’ve certainly expressed it here—with the organization’s most recent efforts to see the Leafs improve, at least some pieces have been added that give us hope. But I try to remind myself that sometimes we may want something and we may even think we’ll be happy when and if we get it. But sometimes when we do get it, things don’t turn out the way we had hoped—or anticipated. This brings me back to when I was a much younger Leaf fan back in the summer of 1974. The Leafs at the time were, under General Manager Jim Gregory, in the midst of another “re-build”, having been picked apart by the World Hockey Association after the 1971-’72 season. Gregory had drafted well in the summer of ’73, selecting Bob Neely, Lanny McDonald and Ian Turnbull. He also showed some courage and daring by thinking outside the old NHL “box” and grabbing un-proven European free-agents Borje Salming and Inge Hammarstrom. Darryl Sittler (drafted in the first round by Gregory in 1970) was emerging as a future team leader and while we didn’t have the world’s best goaltending at the time (this was post-Bernie Parent and pre-Mike Palmateer), the Leafs were building a fairly solid team. Not a Cup contender, but an improving young team, though oldsters Dave Keon and Normie Ullman were still around. I remember feeling that, if we just had a been more toughness and scoring (and better goaltending, too, of course) we may be able to make strides in the forthcoming 1974-’75 season. What happened? Well, the Leafs made moves to acquire two guys with a pretty solid track record that summer, and as a fan, I applauded the moves whole-heartedly. “Cowboy” Bill Flett came over from the Stanley Cup champion Flyers and winger Gary Sabourin was acquired from the St. Louis Blues. Flett had the great nickname ("Cowboy"), was a “Cup winner” and had been part of the “Broad Street Bullies” with the Flyers. Throw in that he had once scored more than 40 goals in a season, and I thought the Leafs had essentially stolen a near All-Star away in his prime, dealing only two players for Flett who did not seem to have a future in Toronto. 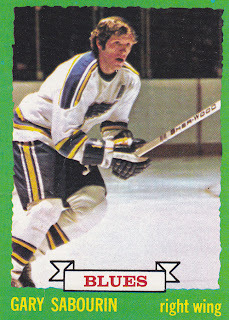 Sabourin, for his part, was a grinding, two-way winger who had three times scored more than 25 goals in a single season with the Blues. He was acquired for aging goaltender Eddie Johnston, so again, I saw that as a great trade. What I hadn’t taken into account was this while Flett was certainly an OK player, (and it’s not like I hadn’t seen him play in Philly), I had kind of brought into the idea that almost anyone from the Flyers had to be really good- and would make the Leafs better. But that was the problem. His flaws were covered up to the casual observer by the fact that he had been with the rough and rugged (and very talented) Flyers. While he was a fairly big guy, toughness wasn’t really his game. And he scored those 40+ goals playing mostly with Bobby Clarke, probably the best center in hockey at the time, in the prime of his NHL career. In Toronto, Flett never quite fit in. He played a lot with Keon but their styles never really meshed. Flett looked slow, and I watched in frustration as he just seemed out of sorts in Toronto colours. He finished the season with 15 goals and never quite found his stride. The team struggled, barely made the playoffs with a horrible record and though they managed to upset a very good LA Kings team (coached by former Leaf star Bob Pulford, with future Leaf Dan Maloney and Star goalie Rogie Vachon in the line-up) in the preliminary two-out-of-three round, they were hammered by the Flyers (Flett’s old team) in four straight games in the next round. 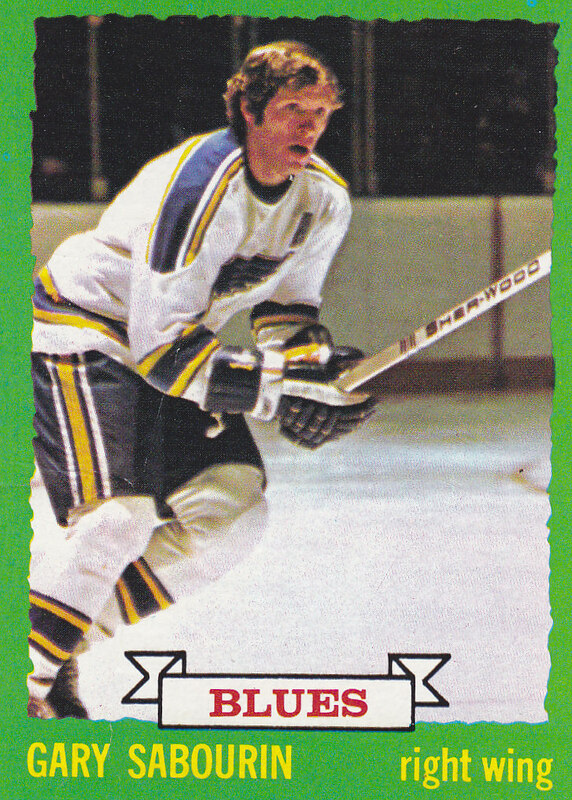 Though only 31, Flett was gone after that one season, though he had some very nice seasons later in the WHA. Sabourin struggled, too. He ran into some injuries and never looked to me like the fine player he had been in St. Louis, though he was also only 31 when he joined the Leafs. He managed 5 goals on the season and was traded for Stan Weir (a useful player, but he was given Keon’s old number 14 right away, which I never liked) the summer after his one season in Toronto. Sabourin was productive with the Seals that next year but retired after the 1976-'77 season. Both Flett and Sabourin were solid NHL players. But for some reason, they just didn’t thrive here in Toronto (we’ve seen this movie before, eh?). And this just goes to show, when we are frustrated with moves that aren’t made, maybe, in the end, it will turn out just as well. Wow... did you ever capture my feelings on those acquisitions in the 70's. I hardly even remembered Sabourin, but well-remember Bill Plett. I was sure he was the perfect guy to counter those Broad Street Bullies and imagined his 40 goals would be perennially in our lineup (Colorado and others beware the P A Parenteau's and Gretzky linemate syndrome... almost anyone looks great when playing with great players who make their linemates better)! I actually liked Stan Weir, but never liked him wearing 14 (almost felt like he took on a mantle that allowed for undue expectations to be heaped upon him)... he was no Keon and that number was a sad reminder of Davey's departure (and surprisingly successful 'return' with Gordie and the Whalers - still had that jump in his stride in his 40's). Sure wish he would give us more opportunities to let us honour his contributions to our Leaf memories! I hope for him: True healing of the lasting effects of Ballard and his (the latter's) control issues! We always loved what you gave of yourself to our Leafs... Thank you, Dave! Every trade and every player contract is a risk, that's just part of the reality. But risks have to be taken in order to get where you ultimately want to be, which is lifting the Cup. I've been preaching about the merits of good coaching, and seems I'm not stopping now, apologies for that. It's just that, as I've mentioned before, a well coached blue-collar team can still go a great distance, maybe making a star player somewhere out there say: "Gee, that team's coach sure seems to know his stuff. maybe I'd like to play there some day". Burke is the face of our team now, and it's a sad day for someone who has seen the face of the franchise being Clark, Gilmour or Sundin. A good GM hires a good coach, maybe someone who has fresh ideas about how games can be won, Burke likes truculence, and wants his team to play that particular brand of hockey. Maybe it's just me, but shouldn't a GM's focus be on the "why" instead of "how" of it? The "why" being winning games. I'm personally not frustrated by not getting a star player, but I am frustrated by Burke's unwillingness to get seriously involved in the sweepstakes when the legitimate star players are available. When Kovalchuk or Richards is available, you just have to go there and get involved. If you don't get your man, nothing lost, and indeed your might help raise the monetary value of his contract by a degree or two, so it causes them a bit more trouble in the long run, maybe hampering their ability to get involved when the next star becomes availability. I've mentioned before the merits of genuine blue-collar teams, with the expansion Panthers as a shining example of the fact that you can get places without star players. Well, they had Vanbiesbrouk, who was pretty amazing, but it was a disciplined team playing under Roger Neilson, a wily coach who worked succesfully with what little he had, that made even Beezer's resurgence possible. I'm rambling and digressing here again, but bear with me. When I think of trades and contracts, I know a couple of things for sure. 1) any made deal is a risk. A player might get injured or just struggle for some other reason. 2) I don't know if Burke is into fishing, but the best stories always come from "the one that got away". But if you don't go fishing in the first place, you don't get to tell any stories at all. I don't know if that's a good metaphor, but I kind of like it, so there you go. As much as it is frustrating to me that the Leafs have not made it to the Cup Finals in my entire lifetime, it is prudent to tread the waters carefully on July 1. Criticism toward Burke and his snail-paced rebuild is probably warranted, but not because he has refused to pull the trigger and overpay free agent "superstars". I'm of the opinion that if Burke had a clear-cut blueprint on how to rebuild when he came here (and he was very direct in saying as much at his introductory news conference), he should have stuck with it. It seems he has panicked at times with attempts to bolster the roster immediately (the trade for Kessel for example), hoping that finally reaching the playoffs will satisfy fans and critics. It seems it is anyone's guess at this point what the one-year, two-year, or five-year plan is in Burke's mind right now. But I do applaud him for continuing to resist throwing big money around right now. While reading your post about Flett and Sabourin, I can't help but remind myself of the biggest names and contracts the Leafs have thrown out there in recent years. Jason Blake. Mike Komisarek. Tim Connelly. Jeff Frickin Finger. There's a lot of gambles and cap space eaten up in hopes that these guys would be able to repeat fluke 40-goal seasons, recover from injury bugs, or fulfill potential management believed they possessed. Conversely, the more talented players the Leafs do have have been acquired through the draft and trades, sometimes designed to help both teams as they should. So what do I wish for this summer? That the Leafs continue to toe the line and not waste cap space on free agents, and wait things out until they can get a couple more dependable, impact players for fair trade value. Flett and Sabourin were fine players, InTimeFor62, but for some reason they just didn't seem to mesh here. Too bad. As for Keon, we agree, for sure. It's always been a shame that Dave has been reluctant to return. I do understand it, though, as best one can when you are not in someone's shoes. He still played some tremendous hockey, as you mention, with the old Whalers. He was more beloved than he likely realizes, to this day, in Toronto. CGLN, great post. I wonder if Burke is reluctant to take a risk at this point, seeing as how some of his earlier moves have not worked out. He does appear to be preaching the 'patience' card now, which, as I've said, would be more acceptable to more Leaf followers if that had been put out there as the plan from the outset. I guess it comes down, in part, to his cap management and believing that the young assets he has already brought in will be difference-makers. I don't see it so far in Kadri, Ashton, Colborne, but I may be wrong! I think many Leaf fans are happy he has not "over-paid" to get some of the "bottom-six" free-agents that have signed this week. But a healthy number of fans would still love him to take a run at a difference-making kind of forward or defenseman. Other teams are improving, if only incrementally. Are the Leafs? A very solid post Pete. Thank you. You likely represent a lot of Leaf fans who want to see progress, but not desperation. I can't argue, as long as Burke has also not lost a willingness to, as CGLN said, take a risk here and there. "Never up, never in". But really good stuff. Thanks for a thoughtful post, Pete. CGLN, Burke did make a run at Ricards. It simply wasn't accepted. I'll bet anything he's making offers on Parise and Suter as well. The bottom line is, unless he over pays to an extreme, he has no shot at getting either of them. Even if he pays half a million more than other teams, they won't sign here. The players get to decide where they go, not the GM. The 26th place team, with excessive media scrutiny and one of the lowest take home dollars after taxes for the players, does not have much of a shot at landing superstar free agents. As fans we think everyone must want to play here. Fact is, we have to over pay people to come here for the reasons stated above. It's why practically all our free agent signings are "over paid". To a certain extent, Coops, it's a Catch-22. Elite UFA's won't come here unless the Leafs are a top team; we won't become one of those top teams without some of those elite guys. I'm sure there are factors (taxes, media, etc.) that might deter some players from wanting to come here, but it still always for me remains a mild surprise that more guys would not want the opportunity to play in this kind of hockey market. I understand, and somewhat agree with, Pete Davies' councel for caution. But it's a rare moment when actual impact players are available for a fair market value, because it's a seller's market, if we are talking about starting goalies, top-6 forwards or top-4 defencemen. Burke won't tread into the market when long-term contracts are needed (why does it feel to me like that Komisarek deal just won't die? ), but he's willing to throw short-term money at players who hopefully might be good, but eventually are not. Connolly and Armstrong are good examples, Armstrong got three years, three million per. I was happy to get Armstrong, but the money involved made the deal look very shifty even then, and it turned out to be dead weight. Thank goodness it was only three years. Connolly two years, for 5.5 and 4 million, which seemed a bit high at the time given his injury history. He managed 70 games in his first season, which is more than I expected, but had a rather disappointing total of 39 points, while earning top-6 money. Last season these two had a combined cap hit of 7.75 million, while Brad Richards, a player who is probably better than Armstrong and Connolly combined, and will be for a few more years, was working under a cap hit of 5.75 million. Conclusion? The only positive thing about Armstrong and Connolly contract is their short term duration. Richards' contract will turn into a burden for the Rangers at some point, but right now they have a quality player. Meanwhile, Armstrong has already been bought out, and while Connolly might still impress somewhat, I guess, nobody is expecting much. Unless the CBA will radically change things, true impact players will keep asking for, and getting, contracts that represent high risk while offering potentially high rewards for the franchises involved. I'm happy Burke steered clear of the smaller fish out there, and I'm happy that McClement, if we really need him, got a modest contract. There have been few causes for a Leaf fan to be happy about since the lockout, so I'll take what I can get. Coops, I know Burke made an offer to Richards, but everyone knew that offer was nowhere near its mark. For me, that doesn't qualify as being involved. I understand why a lot of people would be wary of offering Richards the kind of deal he eventually got, but I personally would have done it then, and I would still do it today. If Burke had offered him that deal and he still had chosen Rangers, fair enough. But Burke wasn't buying, he was kicking tires. Here's a nice link for the Leafs fans. Biggs might turn into a very nice third-liner. Add in Brad Ross, Maybe Broll and and Devane on the 4th line and we might have some toughness that can actually play the game. I'm sure some of these guys will never go beyond the AHL...but it's July and so I can be optimistic. The Leafs haven't lost a game in two months. Thanks for the link, DP, but for me, that just proved how wide of the mark the current Leafs brass is. How many points does dropping your gloves and winning one actually net you? So our prospects are fighting each other in the camp to make a statement, and that's a good thing? For me, it's just twisted priorities. Not sure I can say it better than that, but if you fight a teammate to impress Brian Burke, you are entering a world that should have been left behind a long time ago. Maybe I'm wrong, and intimidation is the way to go, but I'm just so goddamned tired of truculence. If we will win, we will win by playing good hockey, making the right pass, and generally by being better than the others are. Dropping your gloves and winning the fight are not something we're as deprived of as we're deprived of pure talent. I will give you my positive spin on today's scraps. I think both Biggs and Broll are better hockey talents than Colton Orr and Jay Rosehill. Both Broll and Biggs have terrific size, 225 and 218 lbs, respectively...and still growing. Perhaps in Biggs and Broll we have two tough guys that can actually play the game...I am thinking of guys like David Clarkson, Travis Moen,Wayne Simmonds Steve Ott...even Chris Neil.